Tuesday, April 25, 10:30-11:30 a.m.
Wednesday, April 26, 1:30-2:30 p.m. If you are unable to attend a session for Grading in KSIS but would like to receive training, contact Fred Darkow at 785-532-3138 or fdarkow@k-state.edu to discuss availability. Graduate students who plan to send their electronic theses, dissertations, and reports (ETDRs) to the Graduate School have about four weeks left before the semester deadline of 5 p.m. Friday, Nov. 18, when ETDRs must be submitted via the K-REx system. Monday, Nov. 14 — 1-5 p.m.
Tuesday, Nov. 15 — 10 a.m.-2 p.m.
Wednesday, Nov. 16 — 9 a.m.-1 p.m.
Thursday, Nov. 17 — 9 a.m.-5 p.m.
Friday, Nov. 18 — 9 a.m.-5 p.m. Distance students and those not on the K-State-Manhattan campus may schedule Zoom and phone meetings on a first-come, first-served basis by using the ETDR Request Form (K-State eID/password required). More about ETDR services is on the ETDR website at k-state.edu/grad/etdr. Update from the Graduate School Oct. 28, 2016: Students graduating in fall 2016 may use the new title, author, and copyright formats but are not required to do so. Beginning in spring semester 2017, the Graduate School will only accept ETDRs formatted with the following new requirements. Updated ETDR templates went online in mid-August. Graduate students and faculty advisers should be aware that major format changes were made this summer to the title, author name, and copyright statement in the 2016 Word templates for Electronic Theses, Dissertations, and Reports. In addition, a new 500-word limit on abstracts (350 previously) was added to incorporate a change in January from the Graduate School. ETDR templates downloaded prior to mid-August 2016 need to be updated to meet the new guidelines. For students who haven’t started writing in those templates, it may be faster to download a new template. To get help modifying an older ETDR template, submit an ETDR Request Form (eID/password required). Walk-in clinics are the fastest way to get ETDR help and answers. Although requests for individual, one-on-one meetings can be made via the ETDR Request Form (and may be necessary for distance students), the usual 24- to 48-hour response time may hinder students who need faster answers during the deadline week of April 18-22. 3. Select keywords and subject categories (tip: write them down). See the Guidelines for selecting keywords, and also the List of ProQuest subject categories. 4. Submit your ETDR to K-REx for Graduate School review. Watch the new 7-minute video of the K-REx submission process. 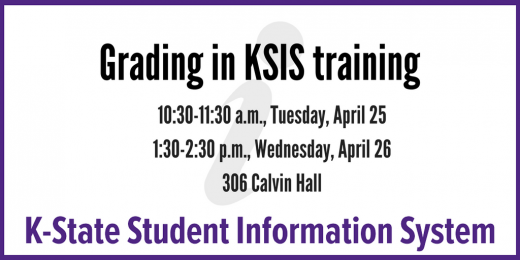 KSIS Training dates and times are now available for fall 2015. Instructor-led training is available for faculty, academic advisors, and staff at no charge. However registration is required. A “Processing Minors” training session is now available for K-State employees who approve minors for students who are graduating. The training session is 10:30-11:30 a.m. Tuesday, April 14, in 9 Fairchild Hall. If you are unable to attend a session for Processing Minors, please contact Fred Darkow at 785-532-3138 or fdarkow@k-state.edu to discuss training availability.